Transform your TV + computer into a basketball scoreboard! PC Scoreboards provides software that transforms your computer and display/projector into an engaging basketball scoreboard for your spectators. 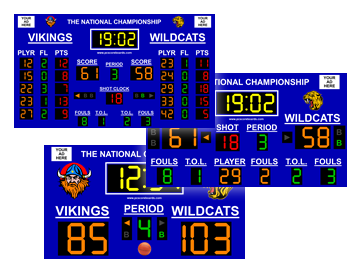 Basketball Scoreboard Standard - Includes the most commonly used features. Ideal for games that don't require a shot clock. Basketball Scoreboard Pro - A more advanced scoreboard that includes the basic features plus a shot clock, TOLs, fouls, and more. Basketball Scoreboard Dual - Simultaneous scoring for two games that share a clock. 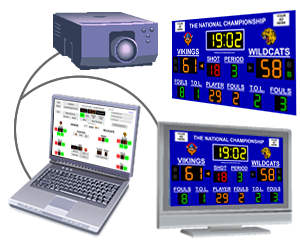 With PC Scoreboards you can use the computer and projector or large screen your organization already owns with our 21st century basketball timer solution. Read more on how our video scoreboards work. PC Scoreboards eliminates the compromises of a multipurpose physical scoreboard by providing basketball specific scoreboards. Our 3 different basketball score keeper applications are designed to accomodate different levels of scoring requirements. 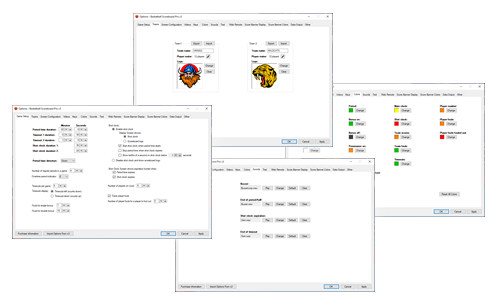 All PC Scoreboards basketball scoreboards feature customizable team names, team logos, colors, sounds, keyboard shortcuts, and various rule settings. Display your teams' names and colors. Use your own period and shot clock durations. Operating our digital scoreboard apps is so simple, anyone can be up and score keeping in minutes. Use our intuitive control screen, customizable keyboard shortcuts, or click and type interface. Purchasing a scoreboard is quick and easy using our automated registration system. Receive your password for uninterrupted use immediately after purchase. PC Scoreboards is the industry leader in software based scoring solutions. 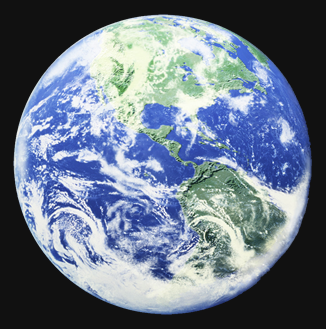 Our 21st century scoring solutions are used by schools, churches, sports facilities, and recreation complexes worldwide. PC Scoreboards has been providing this cost effective, state of the art solution for over 10 years. Download your free fully functional trial of any of our basketball scoreboard apps below.